American Rivers With Economics Evaluation And Research Prepared By University Of Maryland Environmental Finance Center. American Rivers’ report, The Economic Value of Riparian Buffers presents research findings from the Environmental Finance Center at the University of Maryland to increase what is understood of economic values associated with the current scientific evidence supporting protection and restoration of forested streamside areas known as riparian buffers. 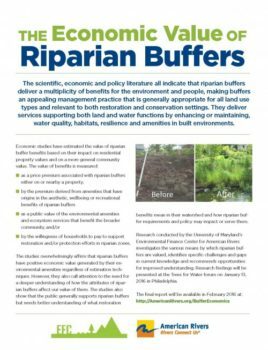 The scientific, economic and policy literature all indicate that riparian buffers deliver multiple benefits for rivers and people and can be an effective restoration, conservation and management practice that is generally appropriate for all land use types. While the ecological benefits of riparian buffers are well understood, the current state of research provides estimates for only two sources of economic value for residential property and community. This report discusses valuation of buffers in terms of their function and identifies economic models that have been used to monetize the environmental, societal and human value of riparian buffers. Riparian buffers have a positive economic value in terms of private and public benefits. The economic value of riparian buffers generally increases with width and length. The public is willing to pay for watershed restoration with riparian buffers. The report also identifies room for more research and a need for greater understanding of riparian buffers and the attributes of buffers that are valued in society in order to achieve broad acceptance, improved protection and restoration implementation and measurable conservation gain.